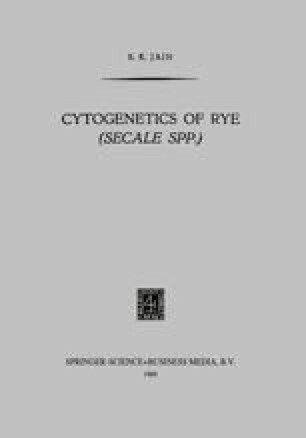 Fruwirth (1923) and Matsuura (1933) included rye in their comprehensive monographs and therefore a useful summary of genetic studies on record prior to 1929 can be found in these two references. Unfortunately, even till this day the genetics of this important genus has not received much attention therefore not to mention the linkage groups even simple markers so often needed in any cytogenetic research have not been identified sufficiently. A few characters are discussed below under individual heads while others have been summarized in Table 9 (see later, p. 427).